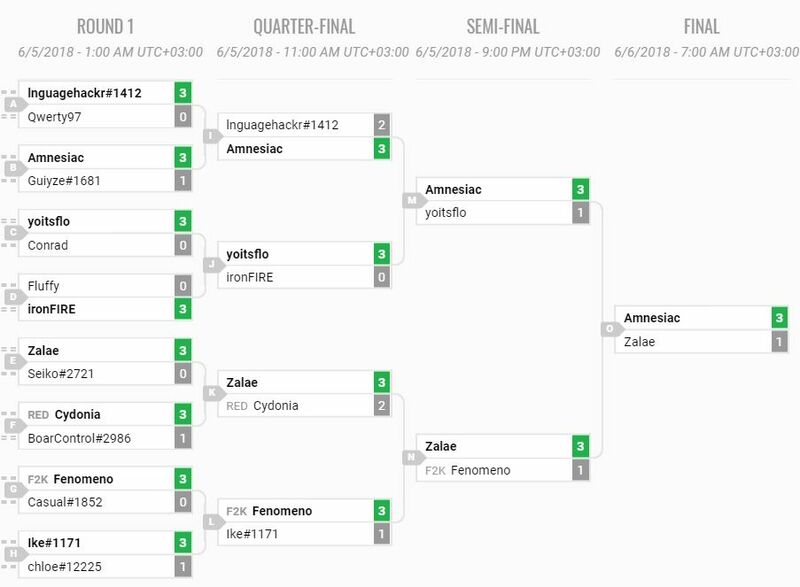 Hearthstone Dreamhack Austin HCT Tour Stop was played from 1st June to 3rd June 2018 in Austin, USA. It was an open Hearthstone Championship Tour Stop, where 226 players competed for a $15,000 USD prize pool and HCT points. The event was played in a best-of-five Last Hero Standing format with one ban. It started with 9 rounds of Swiss followed by a top-16 cut into single-elimination playoffs. The decklists of 223 of the 226 players are available on the bracket site. All statistics are based on these 223 players. It’s definitely a new meta! Paladin and Priest, two popular classes from the previous meta are way down at the bottom. Druid has taken the #1 spot while Warlock is still going strong at #2. Hunters, Warriors, Shamans – all seeing plenty of play! When it comes to top-16, Druid and Warlock are even stronger. Hunter and Warrior plummet, but all classes remain represented. Dreamhack Austin was the first major tournament in the new meta, and that showed in the deck and lineup choices. Open tournaments generally have some weird decks in them, because not everyone comes to the tournament to compete at the highest level, but a new meta introduces a lot of diversity even when it comes to top players. 223 players brought 173 different lineups and 50 different deck archetypes to the tournament, that’s a ton of diversity. Alas, the weeds will soon be cut down as the meta begins to stabilize. If one thing seems given, however, it is that Druid is the winner in the new meta. 169 players brought Druid – 15 of them made it to the top-16. 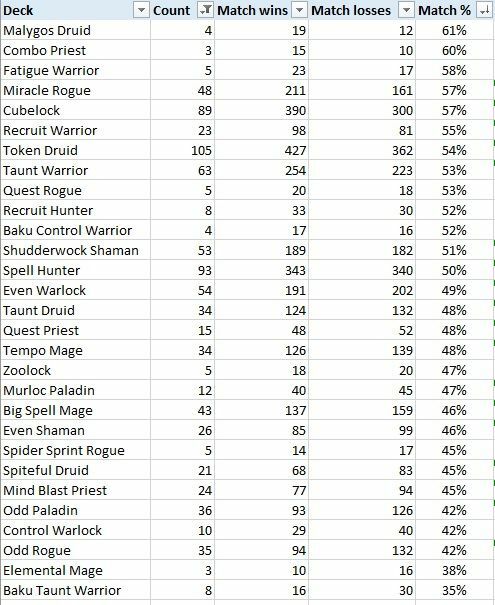 Token Druid was the most popular individual archetype in the tournament with 105 players bringing it – at below 50% of the field that was a far cry from the 100% Jade Druid achieved and the almost 96% that Even Paladin was capable of at its peak, but the meta is still young. Token Druid had the performance to back up its numbers, as 12 players reached top-16 with Token Druid in their lineup. There were seven different Druid archetypes in the tournament and the four most popular of them all made it to the top-16. 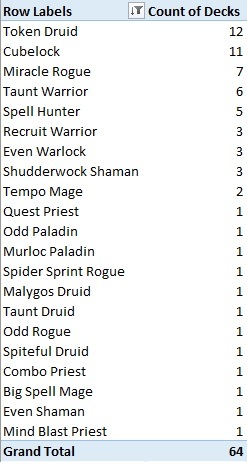 In addition to Token Druid, there was one of each of Taunt Druid (34 overall), Spiteful Druid (21 overall), and Malygos Druid (4 overall) in the top-16. Meta may change, but Warlock refuses to die as long as it has Bloodreaver Gul’dan by its side. 158 players brought Warlock: 89 Cubelocks (11 in top-16), 54 Even Warlocks (3 in top-16), 10 Control Warlocks, and 5 Zoolocks. Even Warlock may have caused a lot of buzz, but looking at overall figures, it was Cubelock that continued to perform superbly. Hunter was the third-most popular choice at the tournament, but it failed hard. 106 players brought Hunter, only 5 of them reached top-16 – all of the 5 were Spell Hunters, which was brought by 93 players overall. There were five other Hunter archetypes present, the most popular being Recruit Hunter, which was brought by 8 players. The best-performing Recruit Hunter lineups were Shoop’s and Ouate’s Token Druid – Cubelock – Recruit Hunter – Taunt Warrior, both reaching a 6-3 record in Swiss. Was Recruit Hunter an asset or a liability for them? All three other decks were part of some of the most successful lineups overall, so they did not look like the weaknesses. It remains to be seen whether Recruit Hunter can become a tournament deck. Warrior has seen play in tournaments all along and in the new meta it was more popular than ever. Statistics have indicated that Taunt Warrior is a strong deck right now, and tournament players had taken notice – 104 players brought Warrior, 63 of them Taunt Warrior. 9 Warriors reached the top-16: 6 Taunt Warriors and 3 Recruit Warriors (brought by 23 players overall). Taunt Warriors and Recruit Warriors did very well overall, but notably the few Baku Taunt Warriors did not do well at all. Bubbling under when it comes to Warrior, there were 5 Fatigue Warriors in the tournament and Dizdemon piloted his lineup with the deck to a 7-2 record in Swiss while Levi reached 6-3. There was also one Baku Control Warrior (of the 4 brought to the tournament) with a decent record – TheChronic reached a 6-3 record in Swiss with Baku Control Warrior in his lineup. Warrior seems to have multiple potential archetypes when it comes to tournament play. Rogue has returned to its roots! 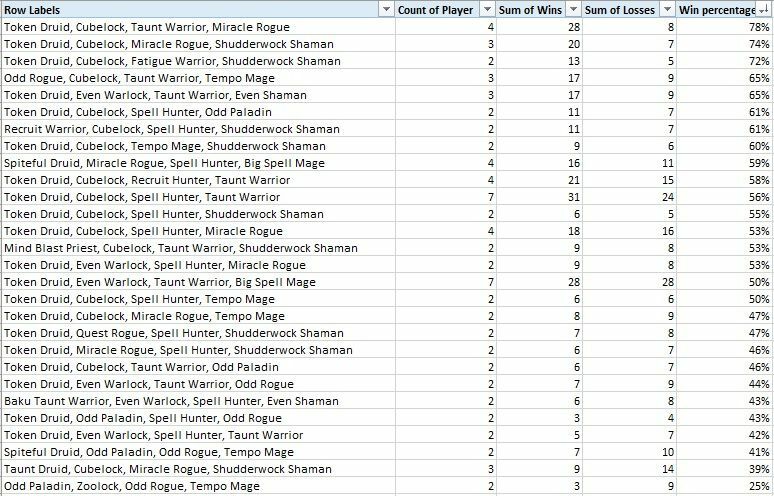 98 players brought Rogue, 48 of them brought Miracle Rogue (53 if you count the 5 decks that ran Sprint instead of Auctioneer as Miracle Rogues)! There were also 35 Odd Rogues and 5 Quest Rogues in the mix, alongside a couple of miscellaneous archetypes. Miracle Rogue really delivered as well: 7 Miracle Rogues in the top-16 alongside 1 Sprint Rogue and 1 Odd Rogue. Yeah, Odd Rogue was another archetype that failed miserably – aggressive decks have not found the keys to success after the nerfs yet. Looking at failures, Mage did not deliver. Out of 82 Mages, only 3 made it to the top-16. 43 Big Spell Mages – 1 made it to the top-16. 34 Tempo Mages – 2 made it to the top-16. Neither the aggressive plan nor the control plan worked. There were 4 Big Spell Mage lineups at 6-3, but the large majority of Mage lineups still failed. Shaman had a hard time as well. 81 Shamans – only 4 made it to the top-16. Shudderwock Shamans were out in force with 53 players bringing the archetype, but only 3 of them made it to the top-16. 26 players brought Even Shaman, but it could not find much success either with only 1 making it to the top-16. Not much was expected of Paladins, and not much was delivered either. 50 players brought Paladin, including 36 Odd Paladins and 12 Murloc Paladins – one of each made it to the top-16. Priest was the least popular class. Oh, how times have changed. Only 44 players brought Priest, and 3 of them made it to the top-16: one of each of Mind Blast Priest (24 overall), Quest Priest (15 overall), and Combo Priest (3 overall). Looking at the overall picture, Token Druid, Cubelock, Taunt Warrior, and Miracle Rogue were some of the big winners in the tournament. Actually, four players brought that exact lineup, and three of them made it to the top-16! What about the fourth one? He finished 6-3. Now, that was one solid lineup! Here are some of the more interesting decks from successful lineups. 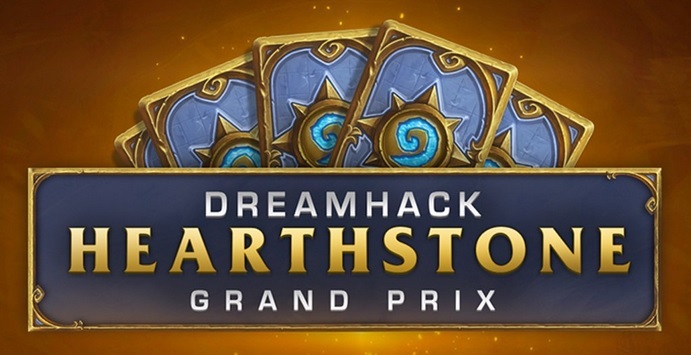 Even Shaman has been one of the best-performing archetypes on the ladder lately, but it did not find much success at Dreamhack Austin with the sole exception of Amnesiac, who did very well with the deck. His take is, surprisingly enough, slightly novel, as it become commonly played only after the tournament. It’s surprising, because he does not use any really new cards, nor are the cards in particularly surprising proportions – quite the contrary! If it is possible to use two copies of a card he has chosen, he uses two copies. That’s good for consistency, and consistency is good in card games. Even Warlock could not quite match the overall success of Cubelock, but Amnesiac made his list work. It respects the tempo roots of the archetype, there’s no Rin condition in this deck, just big-minion-hits-face condition, and, well, Bloodreaver Gul’dan. Amnesiac chose to not include weapon removal and went for a Tainted Zealot tech instead, getting those Defiles and Hellfires to do more work. The rarest archetype to reach top-16, Zalae’s Combo Priest ignores the loss of Potion of Madness. Just cycle through the deck, get something to stick, and kill the opponent. Sounds like a plan. Well, it’s a Miracle Rogue. It’s just your usual Miracle Rogue. Miracles still happen. Spiteful Druid can still win some games. Yoitsflo’s list includes two copies of Grand Archivist for that early Ultimate Infestation and two copies of Druid of the Claw for some charge or taunt power (no Leeroy). Only one Mind Control Tech has made the cut, to keep it a threat in open decklists tournament but to not commit too heavily on the card. Spell Hunter was not very successful in the tournament, but Yoitsflo made it pretty far with the deck in his lineup. There is a nice Secret package in the deck that includes one copy of Rat Trap, another nice choice to force the opponent to play around in an open decklists tournament. Undoubtably one of the stars of the tournament, this double Violet Teacher, double Arcane Tyrant, no Power of the Wild build was brought by multiple players. The deck is simply strong, as once it gets to that Soul of the Forest board, it is very difficult to clean up. Feno’s Cubelock is archetypal: it’s big, it’s aggressive, it wants to hit you in the face. Prince Taldaram, two Faceless Manipulators, Spiritsinger Umbra, even two Twilight Drakes. It was also successful at Dreamhack Austin. Want to beat the big dog, Token Druid? Look no further than Warrior. Feno’s Taunt Warrior list includes Whirlwind, two copies of Warpath, and Scourgelord Garrosh – all you need to wipe tokens all day long.